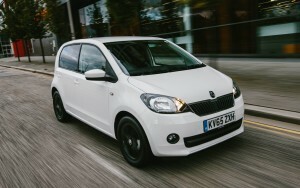 The excellent Skoda Citigo is to get a new Black Edition which has a striking design to help it stand out from the crowd. Along with its 15 inch black alloy wheels, the spec also includes air con, extra speakers for the infotainment system and a multimedia holder. There’s also a height adjustable driver’s seat and electric front windows. Along with the striking exterior, designers have also revamped the interior to offer what is a value for money special edition. Available in either five or three door form, the new Skoda Citigo has a 1.0 litre MPI engine under the bonnet which produces 60 PS. There’s a choice of two body colours, either a deep black or a candy white, as well as privacy glass for the rear windows to help give it a noticeable road presence. In addition, drivers will also find that the new Skoda Citigo Black Edition also comes with the firm’s portable infotainment device (PID) which has features including hands-free Bluetooth connectivity, satnav and it’s also a multimedia player. The Skoda Citigo has picked up a slew of awards this year and is a popular small city car with buyers praising its reliability and economy. The car is a fun vehicle to drive around town with its frugal and sprightly engines and there is also plenty of space on board for passengers despite its exterior dimensions. The car is also packed with various technologies and safety features including active brake assist. Launched in the UK in 2012, the Citigo has been a popular car with buyers and continues to fight off recent entrants to the competitive segment with its low running costs. Drivers of the Citigo Black Edition can expect fuel economy of around 69 mpg on the combined cycle and CO2 emissions of 95g/km. The new Skoda Citigo Black Edition is on sale now priced at £9,990 OTR for the three door special edition while the five door costs £10,340. This entry was posted in Car Leasing, Cars, Low Emissions Cars, Small Car and tagged skoda citigo by Steve Lumley. Bookmark the permalink.